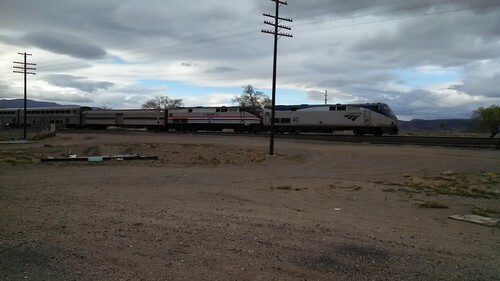 This morning's eastbound California Zephyr was running about 45 minutes late through Fernley, and I was out watching it when I spotted unusual power on board. The locomotive in question has been going back and forth through here every few days, but I finally had enough time to get my camera out to snap a picture. Trailing a conventionally-painted Amtrak P42 number 40 is Amtrak 822, a P40 painted in the Phase III scheme I tend to most closely associate with Amtrak locomotives before the current Phase V scheme (first launched with the high-speed Acela trains) took over the system.